Shop Manager has been hosting a special series of weekly events since last July, and she’s almost been through all the Twinity-run shops. Not to worry though, she’s been saving some of the best places for last, so if you’re only finding out about these events now you’re still in time to get in on some amazing deals! Don't miss the amazing sale offers! 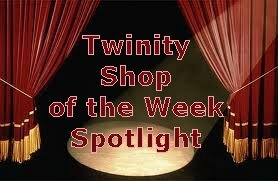 Each week she hosts the Shop of the Week event, where a different Twinity Shop is featured. Each featured shop has at least one item on sale for only 5 globals (and don’t forget, you can use promo globals for Twinity sold items) – but only during the 1 week that the shop is featured! If this is your first week of attending you are in for a special treat because she’s put several items on sale. All you have to do is visit the shop and find them! ‘Tis the season and Santa did a warmup run for his big night by taking a trip around the world in Twinity, leaving behind lots of free gifts for all the nice Twinizens! Starting with Christmas Island, he left 3 different gifts for males and females and if that wasn’t enough, he also left a snazzy seasonal furniture item! Look for these items in each city to get your special limited edition Christmas gift items! Keep your eyes open for these items – there is one of each tucked away near the landing point in Berlin Center, London, Miami, Palmadora Island, Singapore and New York City and each one has another free gift for you! 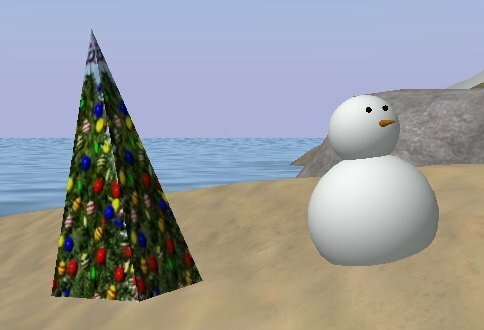 The snowmen have male items and the trees have female items. How many can you find on your own without help? Get out there and start your gift searches, all items are limited editions and they won’t be around very long! Twinity’s classic lingerie shop, Belle de Jour, has been updated and you’re invited to a party to check out the changes! It’s got new items, corrections to older items, and an exciting new emphasis on the ability to freely mix and match pieces, to let you combine pieces into a never-ending series of new looks! Don’t forget our Spotlight Shop focus on Halloween either! Today is your last chance to get the special sale item at The Lightworks, and tomorrow the spotlight shines on Costume Jungle!